The company with those odd employees, of course, was Copyblogger Media (now known as Rainmaker Digital). The story of what happened follows. Up until that point, Copyblogger had been offering an email newsletter to attract and capture email subscribers. Pretty standard in the online business world. We wanted to up the ante. So we launched My.Copyblogger.com — a free membership site, where people sign up to access (at the time) 15 free ebooks and a 20-part email course. Think of a content library as a password-protected source of premium content that you can access once you register with your email address. That’s essentially what a “content library” looks like. But how did it perform? Let’s look at the results to see. Through the first seven weeks, the free subscription page averaged a 67 percent conversion rate. The first week’s growth was 300 percent bigger than the best week of growth for Internet Marketing for Smart People (a previous Copyblogger 20-part email course) — closer to 400 percent, if you include new paid subscribers. The most visited page on Copyblogger at the time was behind the paywall — with almost a third of all traffic logging in after arrival. Those are some substantial results, particularly in such a competitive space as content marketing. Now, I can’t promise you the exact same outcome, but I can promise you that a content library will, at the very least, increase the number of subscribers you capture. The key, as always, is to build trust first by providing a ton of value before asking for anything in return. If that concept is new to you, then you can review how to build the know-like-trust factor. In the meantime, let’s dig a little deeper into the common questions surrounding lead generating content libraries. You’ll hear sales and marketing people refer to a content library as a bank of all the content assets owned by a company that is placed in a central, internal portal so other departments within that company can access that content. That’s not what we are talking about here. Yes, a content library is a bank of content, but in the way we will be using the phrase, it is full of resources that your audience can access once they register with an email address. In other words, the public can access these resources, which makes this type of content library a lead generation tool. 2. What type of content goes into a content library? The trick is to offer enough value that prospects view signing up for your content library as a no-brainer — an insane bargain. See Question 5 for some examples of ways you could structure your content library. 3. What makes a content library better than a conventional email newsletter? When you offer more resources for the same price (in this case, an email address), you are naturally going to get better results. Our case study is one such example. With a content library, you are likely to elevate more of your visitors into an ongoing relationship — in other words, a content library will help you convert more prospects into solid leads. But not just any type of lead. See, the main difference between a typical email newsletter and a content library offer is that with the content library, you can now identify your site visitors, which ultimately helps you convert more leads into sales. 4. What’s the difference between an email sign up and website registration? In both cases, it’s true that the prospect gives you an email address. With a sign-up, you have permission to send that person email — namely, your email newsletter or latest published blog posts. With a content library registration, you give your prospect access to a site — access to exclusive resources like ebooks, videos, webinars, forums, and more. In the first situation, the content marketer is throwing stuff at the prospect. In the second, the content marketer is inviting you to his place — which is loaded with useful resources. And like I said before, when people visit your site as signed-in members, you can customize your promotional messages, which leads to higher conversions. 5. 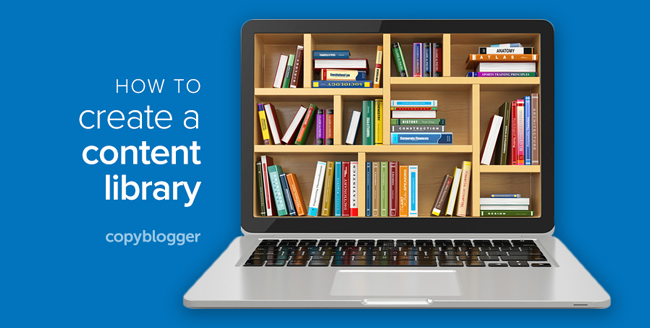 How many resources should you put into a content library? There isn’t a hard-and-fast rule. However, you need to include more than one piece of content. Don’t forget: you are trying to create a sense of great value. For example, a content library with two, five-page ebooks is not going to suggest high value. But four 50-page ebooks and seven 30-minute training videos, however, will suggest high value. As you can see, the numbers of ways you can structure your content library is limitless. Which leads us to our next question. 6. Do I give access to all the content at once? The short answer is to start by giving away a large amount of content to create a sense of high value. The ebooks in the original My.Copyblogger content library ranged between 31 and 142 pages — and there were 15 ebooks, plus a 20-part email course. However, you can start small and build as time goes on. For example, make the promise of adding more content once a month (or the frequency that works for you). That strategy has a number of benefits. It brings all those members back to your site every time you release a new piece of exclusive content. In other words, you don’t need all the resources in place before you launch. If you only have four ebooks and two podcast episodes, you can launch with that offer. But as you add more resources, don’t forget to update your content library’s promotional copy and alert your members. 7. How do I get people to my content library? If you already have an email list in place, then promote your content library to that list. With My.Copyblogger, an announcement was sent out to our general email list, and because there were 15 ebooks, there were 15 unique email promotions sent out, each one customized to that particular topic. We sent out one of these emails a week, usually on a Friday. Depending on the number of resources you have, your campaign might end up lasting two or three months. Before sending each email, suppress the email addresses of people who have already registered, so those members of your community aren’t annoyed by seeing the same pitch multiple times. If you don’t have a list (or want to continue promoting the content library after you’ve finished the campaign to your email list), the next step is to create high-quality, tutorial-type blog content that leads to a promotion of the content library. Once people are on your site because of this high-quality, tutorial-type blog content, give them an opportunity to register. 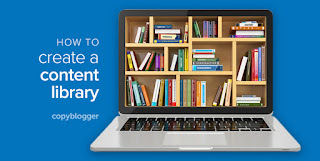 Include a footer at the end of each blog post that encourages visitors to register for your content library. Add a sidebar that appears on every page of your website. Create feature boxes that appear in the header of your website. Use pop-overs and pop-ups (yes, there is a difference). Learn more about these strategies in Beth Hayden’s article, 4 Quick Solutions that Spawn Radical Email List Growth. 8. Won’t content that requires a registration hurt SEO efforts? True, the content behind the registration wall won’t get crawled or indexed by Google (or any search engine for that matter). And every single one of those pages is what we call a cornerstone content page — which drives social and search traffic to register for the content library on My.Copyblogger. You can call it whatever you want to call it. It’s a good idea to mention in the description copy that this is a library of resources — and be very specific about what is in it. You want to give your prospect the sense that there are some really juicy resources behind that registration wall. 10. Does this mean I’m starting a membership site?!?! I added all those question marks and exclamation points because what most people say immediately after asking that question is … I’m not ready for that! You get a real sense they are scared out of their wits. If that’s you, relax, because registering people as members doesn’t mean you’re suddenly running a full-fledged membership site. It just means people are joining your community. However, if you achieve critical membership mass, a nice touch to your content library would be to offer a simple forum where your members could chat, share ideas, and ask you questions. Our Rainmaker Platform enables someone who is dumber than a bag of bricks when it comes to coding (like me) to set up a password-protected content library — plus a forum — by simply grunting and pointing (like I do). In the end, what really matters is that members of your community — even if what you offer them is free — benefit from content that’s tailored to their customer journeys.